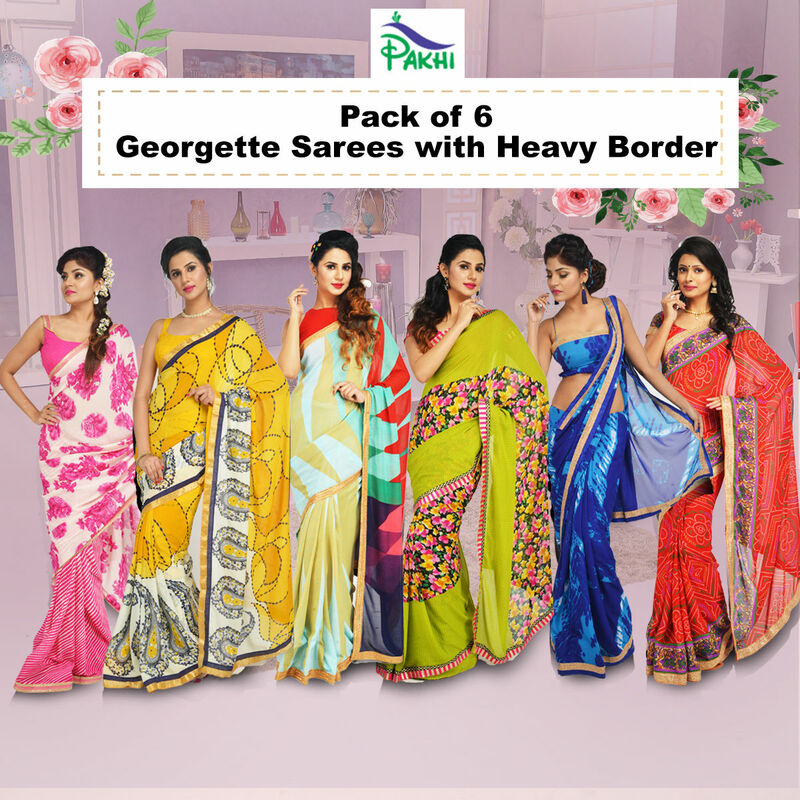 Bring out the charm of ethnicity with Pack of 6 Georgette Sarees with Heavy Border by Pakhi (6GBS1), a must-have addition to your saree collection. Made from georgette fabric, they are lightweight, easy to drape and comfortable to wear all day long. The sarees are embellished with either leheriya, bandhej and floral prints. Vibrant and appealing, this saree measures 6m and comes with a 70cm blouse piece, sufficient enough to try various styles and designs. Versatile & charming, Pack of 6 Georgette Sarees with Heavy Border by Pakhi (6GBS1) is a perfect pick that will suit your taste and style. 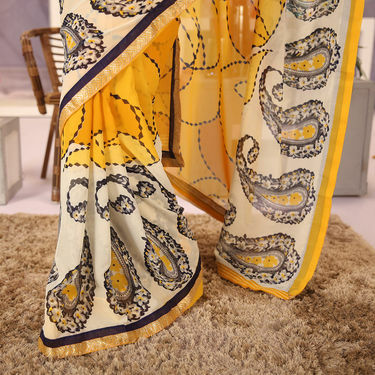 The traditional colours and running prints in the combo is must have addition to your existing saree collection. Material: Made from georgette fabric, these sarees are light in weight and easy to drape so that one can wear them for long hours comfortably. Designs/Prints: The collection is ode to nature inspired leheriya, bandhej and floral prints that look ravishing overall. The colours are rich and vibrant, thus are suitable for all types of skin tones. Durability: The vibrant colours and rich prints of these sarees does not lose its colours even after several washes keeping it fresh look always. Maintenance: The maintenance of these sarees is not a costly affair. Using plain cold water either by hand wash or machine wash condition them and keep it fresh for long. Also, dry cleaning is not required for these sarees. Style Tip: Wear any saree from this set of 6 Georgette sarees with complimenting blouse and ethnic jewellery to make it a perfect wear for festive season, evening parties or casual wear. If you are looking for fashionable and trendy sarees, then opting Pack of 6 Georgette Sarees with Heavy Border by Pakhi (6GBS1) is best to go. The combo is affordable and saves your money on buying separate sarees for different occasions. Pack of 6 Georgette Sarees with H..VSPick Any One Georgette Saree with.. Pack of 6 Georgette Sarees with H.. VS Pick Any One Georgette Saree with.. 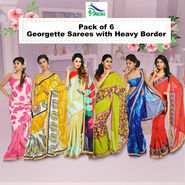 Pack of 6 Georgette Sarees with H..VSPack of 9 Assorted Printed George.. Pack of 6 Georgette Sarees with H.. VS Pack of 9 Assorted Printed George.. Pack of 6 Georgette Sarees with H..VSSoumya Collection of 9 Georgette .. Pack of 6 Georgette Sarees with H.. VS Soumya Collection of 9 Georgette .. Pack of 6 Georgette Sarees with H..VSNivedita Collection of 7 Printed .. Pack of 6 Georgette Sarees with H.. VS Nivedita Collection of 7 Printed .. Pack of 6 Georgette Sarees with H..VSPack of 4 Designer Sarees by Zuri.. Pack of 6 Georgette Sarees with H.. VS Pack of 4 Designer Sarees by Zuri.. Pack of 6 Georgette Sarees with H..VSPack of 6 Assorted Sarees with He.. Pack of 6 Georgette Sarees with H.. VS Pack of 6 Assorted Sarees with He..